The county was not able to come to terms with either of the property owners. In the meantime, the county has gone forward with plans to upgrade its pump stations and pipelines leading to the Calls Creek plant, making it all the more important that the pipeline down Calls Creek be built. With the pipeline in place, the county could phase out the Calls Creek plant at some point in the future if it had success in acquiring property on the Middle Oconee River for a new plant. In that case, the pipeline down Calls Creek could be converted from a conduit of treated sewage water to one that carries raw sewage from throughout the county to a new facility on the Middle Oconee River. The decision to upgrade the pump station on McNutt Creek near Kohl’s and the transmission line down Daniells Bridge Road and Government Station Road leading to the Calls Creek plant is a result of inaction by the county on a key planned transmission line. 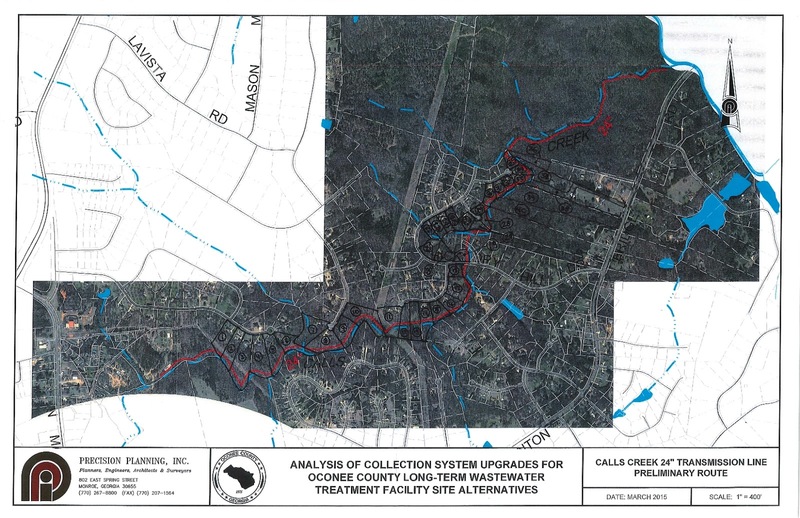 Although the county has completed or has in stages of construction a sewer line along McNutt Creek to bring sewage from as far away as Bogart to the pump station near Kohl’s, it has done nothing to build the continuation of that line along McNutt Creek to the Middle Oconee River. This is the case even though the stated goal of the county is to eliminate pump stations in favor of gravity fed sewer lines, which the pipeline from Bogart to Kohl’s is and the continuation of that pipeline along McNutt Creek to a future plant on the Middle Oconee River would be. Plans for that 5.8-mile McNutt Creek and Middle Oconee pipeline have been mothballed as too expensive in favor of the 2.9-mile Calls Creek pipeline and the expansion to the pipelines already in place along Daniells Bridge Road and Government Station Road. This is true even though the Board of Commissioners voted in May of 2014 to declare a portion of the 2009 Special Purpose Local Option Sales Tax revenue set aside for “Water and Sewer Facilities” as surplus and use the money instead to pay off the debt on the county jail. This transfer saved the county $79,000. The McNutt Creek line from Kohl’s to a future Middle Oconee River plant could have been built in phases, and a small section of pipeline exists to accommodate development along the creek at Old Macon Highway. The county has never acknowledged its so-far unsuccessful efforts to buy property for a Middle Oconee treatment plant or additional property around its existing plant. It also has never discussed its upgrade to the McNutt Creek pump station and lines down Daniells Bridge Road and Government Station Road as being needed because nothing had been done on the McNutt Creek extension. It also has not acknowledged how crucial the Calls Creek pipeline is to county planning and how long it has known that to be the case. The discussions of these activities and the role the Board of Commissioners has played in them are hidden in the minutes of BOC executive sessions, which do not have to be released to the public unless ordered by a court. The county is refusing to release these minutes voluntarily. I have pieced together the incomplete story of the pipeline and sewer plant activities undertaken from conversations I’ve had with people involved and from documents I’ve been able to uncover. 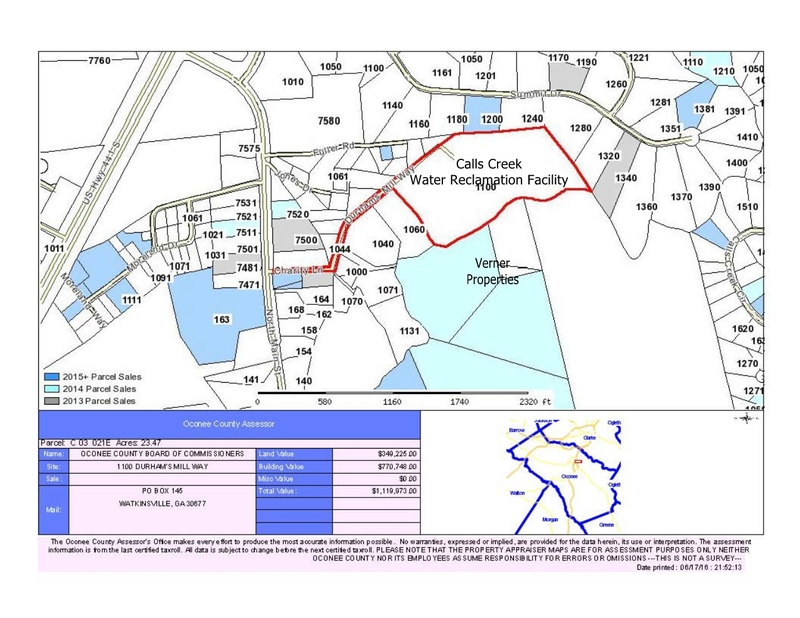 Ironically, the central document was a map released by Utility Department Director Wayne Haynie last spring to those involved in the fight to keep the pipeline out of Calls Creek. It is dated March 2015, even though the county’s didn’t tell the residents about survey work for the sewer line until February of this year. That March 2015 date led me on a chase that revealed that the county had appraised two key properties for future sewage plant sites and that negotiations with the owners had been unsuccessful. Work on the Calls Creek line began in earnest as a result. Jimmy Parker, whose Precision Planning Inc. is doing the survey work for the proposed Calls Creek sewer line and drew the map above, told me following a meeting with concerned citizens back in March that he had been informed that the county had been unable to purchase a piece of property it wanted for the Middle Oconee plant. That property, because of its critical location along the Middle Oconee River upstream from Simonton Bridge Road, has never been much of a secret. It is the large property at the top, right in the map above and is where Calls Creek joins the Middle Oconee River. The 207-acres are owned by McRee Properties LLLP. According to the Georgia Secretary of State database, Virginia S. Wells is the registered agent. Oconee County Utility Department Director Wayne Haynie also has said on numerous occasions that a neighbor of the existing plant was interested in selling land to the county. 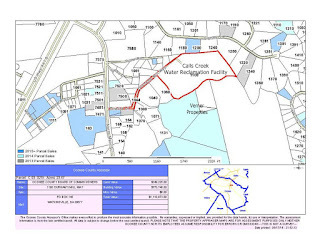 Lemuel Lee Verner owns numerous properties near the existing Calls Creek plant, including four parcels totaling 28.5 acres directly across Calls Creek from the 23.5 acres owned by the county on which the existing plant sits. This land is labeled on the map above and sits to the left of land owned by Mark Thomas, newly elected to the Board of Commissioners, and his brother. I filed an open records request on June 9 of this year for the appraisals on those two properties. I also asked for accompanying documents and correspondence obtained by the county related to the appraisals. O.C.G.A. stands for Official Code of Georgia Annotated. I wrote back to Greathouse, who is the county open records officer, reminding her I also had asked for accompanying documents and correspondence. Since Greathouse did not say that the records I was seeking did not exist, she provided a confirmation of the appraisals. Nonetheless I asked her on June 13 if she could confirm that the appraisals I was seeking existed with the county. “While negotiations are ongoing, we are unable to disclose any information about the transaction,” Greathouse responded. That provided further evidence that what I had been told about the existence of the appraisals was correct. I also asked Greathouse on June 13 for the minutes of two executive sessions held by the Board of Commissioners on March 9 and March 19 of 2015. I also asked Greathouse for notes taken by her outside the executive session that would elaborate on who attended the meeting. “It has further been determined that records responsive to this portion of your below Open Records Request do not exist,” she wrote. I discovered the presentation inside an email message from Parker to Haynie in November of 2015. 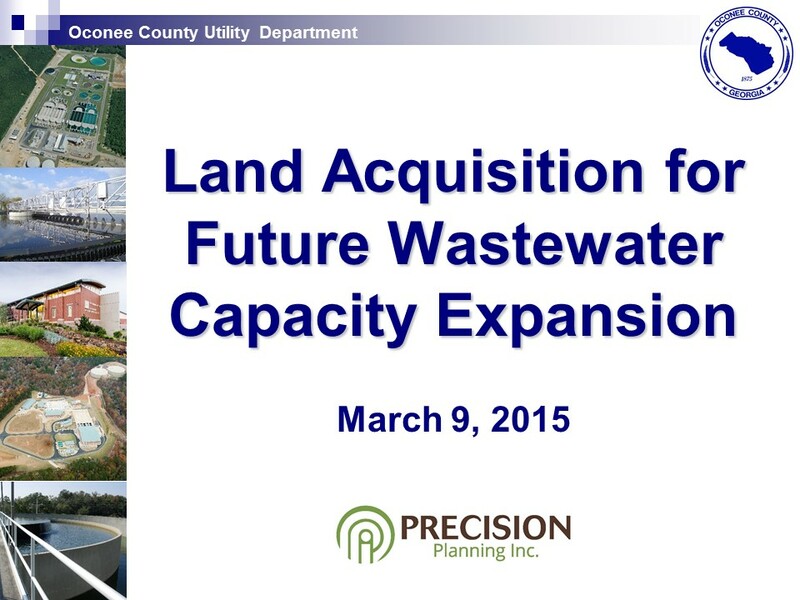 That was at a time, acknowledged in the PowerPoint, that the county officially was only talking about expansion of the Calls Creek plant from its current .667 million gallons per day to 1.5 million gallons per day of capacity. Present plans are to expand to 3 million gallons per day, and the county needs the Calls Creek line to do that unless the state will provide an exemption and allow it to dump more treated wastewater into Calls Creek than the 1.5 million gallons per day now authorized. That was the date of Parker’s PowerPoint. The minutes of that called meeting indicate only that county Administrative Officer Jeff Benko, County Attorney Daniell Haygood, and County Clerk Greathouse were present in addition to the five BOC members. The Board voted immediately to go into executive session. The BOC stayed in executive session for 2 hours and 18 minutes and adjourned immediately when it came out of executive session. That session lasted 1 hour and 50 minutes. Again, no action was taken once the executive session ended. The Board of Commissioners also holds executive sessions after most of its regular meetings, and it is impossible to know what is discussed at any of these meetings. The continuation of the McNutt Creek sewer line from Epps Bridge Parkway at Kohl’s to the proposed Middle Oconee River wastewater treatment plant has been a critical part of the county’s water and sewer plans since at least 2004. 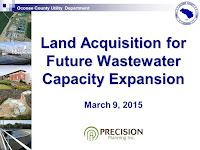 It is included in the currently operative 10-Year Wastewater System Strategic Plan FY 2015-2025. Based on that document, Tony Greco, an aquatic and wetland ecologist at Nutter and Associates Inc., an Athens environmental consulting firm, and I plotted out the characteristics of the unbuilt route. Greco lives on Calls Creek near the Wells property. As we traced the route following the creek on the Oconee County side, it would cross 40 properties and right of way of the state for SR Loop 10. Only 22 of the properties crossed by the McNutt Creek continuation line have single-family homes on them, in contrast with 33 for the proposed Calls Creek line. Most of the residential properties affected by the McNutt Creek continuation are in upscale Tanglewood subdivision. The line would cross large amounts of undeveloped land along McNutt Creek as well as along the Middle Oconee River itself. The county already has a sewer line with easements along about a third of a mile of the route, currently providing sewer service to the student housing complex Athens Ridge and nearby commercial centers under development. That sewage is being pumped up to the Calls Creek plant, largely along U.S. 441. The existing and under construction McNutt Creek line from Bogart to Epps Bridge Parkway is 18 inches in diameter. The proposed line down Calls Creek is 24 inches in diameter. I asked Utility Department Director Haynie for an explanation for the discrepancy. The answer indicates how much work already has been done on the proposed Calls Creek pipeline. The line running down Daniells Bridge Road and Government Station Road is forced main, rather than gravity flow, making size comparisons with the McNutt Creek and Calls Creek lines inappropriate. The plans are to upgrade that Daniells Bridge Road-Government Station Road line from 6 inches to 12 inches later this year. The reason for the upgrade is that the 6-inch line isn’t capable of handling the increased sewage the county wants to pump to the Calls Creek plant from the pump station on McNutt Creek at Kohl's. That sewage will be pumped up from Kohl’s, cross under SR Loop 10, and then be pumped down Daniells Bridge Road and Experiment Station Road, ultimately reaching the Calls Creek plant. Haynie said he hopes to have that project out to bid in June or July of this year. He expects construction to take place in late summer or early fall. Such an expanded sewer line down these two roads with the accompanying upgraded pump station at Kohl’s would not be necessary had the county built the gravity-fed continuation of the McNutt Creek line and had in place a water treatment plant on the Middle Oconee River. I think the no sewer in calls creek group should file suit to get all of the minutes and records. The BOC obviously doesn't want the citizens to find out what they have been doing in secret. This seems to prove just how corrupt the county government has become. Great reporting Lee. You should have your findings printed in the oconee enterprise and Athens banner herald. Thanks Lee for the great reporting. Too bad they did not find or borrow 20 million for the plant itself and get the plant built during the economic downturn. The plant could be just setting there ready. Only problem is line down calls creek still required. Yes, fantastic reporting. Really appreciate your taking time to find out this and to let them know that someone is watching them. They clearly do not want to be watched and that shows just how divorced from the citizens they are. But the citizens keep voting them into office so most citizens don't care how they operate. Funny how Precision Planning Inc gets so many county contracts. They always seem to get every county contract they put in for. Weren't they involved with Caterpillar, when the county had to go back and spend huge money on issues with one of the roadways in and out? The design of the roadwork for Caterpillar was done by Williams and Associates. Reading this is sickening and, along with recent BOC decisions about other growth, further justifies our growing reasoning to leave leave once the kids finish high school. (Been here for 11yr) BOC lacks a unified vision about its growth and demonstrates little concern for its citizens. I feel sympathy for others who are locked in and unable to move. PS, the guy who says "Keep it Classy" ala Ron Burgundy, says it all. Yep, BOC hasn't a clue. Disappointing for an area that could offer much more via cross pollination, collective intellect, an innovativation in proximity to a major University town. Too bad this was not out before the election. Lee I wish every voter in the county would read your blog. Maybe then there would be more concern and more people attending BOC meetings on a regular basis and not just when something is happening in their back yard. Keep up the good work and thanks for all you do. The citizens of Calls Creek will not stand by and allow you to make a mess of our land simply because you abused funds in the past--funds that should have been allocated for a new sewer plant. These are not uneducated people, and they are funded. These people will not go away quietly and they are prepared to make this ugly if need be.